Clarets boss Sean Dyche admitted he was so concerned about the failure to prevent a Blackburn fan confronting his players, he almost took matters into his own hands. A home supporter came out of the Riverside stand after the Clarets took the lead in their Carabao Cup tie at Ewood Park, with a Jack Cork goal, and put both hands around the throat of midfielder Ashley Westwood. 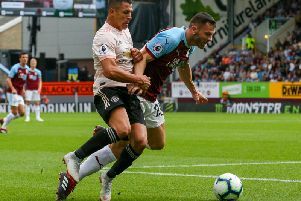 The stewards were ponderous in their actions, and Dyche said: “I believe so (hands around Westwood’s throat), I haven't seen it up close, but it got to the point we were going to go on because I can't have that. “Not to do anything ridiculous, just to say ‘whoa, this can't happen’. “I think it has to be looked at across the board, and is doing, stewards do a terrific job in difficult circumstances. He added: “I think we’re all concerned with the bigger picture, there used to be a time when people got on a football pitch kind of in jest. “It was something silly, and could almost be laughed at. “Now there's all kinds of different things going on in the world and on a football pitch it has to be stopped very quickly - that's not just this football club, I have to make that absolutely clear, that's across then board, any sporting situation. “It's a shame that happened tonight, no one wants that to happen, stewards do a terrific job all around the country, but they've got to get on quick. “The situation has changed, years and years ago people came on almost for fun, almost part of the game and we all used to laugh. “You don't know what they're doing now, so people have to get to that situation really quickly and it seemed a really long time before anyone did anything, and our players had to eventually defend theirselves and that can't be right anywhere in football. When security arrangements have seen 5,000 Burnley fans bussed in, to avoid trouble, you would imagine fans were then unable to come onto the pitch, and Dyche said: “I don't know the complexities of it, the policing, it's a shame that has to happen, I understand it, I understand rivalry, that you have to bus people into a game they could just come and watch, but to think you do all that and someone just wanders onto the pitch, it's bizarre. People seen to come on with more anger these days, I was at the game (where Brian Clough cuffed his own fans in 1989 when they invaded the pitch) and that was in an era when a clip round the ear would have done that, but these days it doesn't sort it out, it needs more than that.